Citing safety concerns, a growing chorus of local politicians is urging the Nuclear Regulatory Commission to halt the relicensing process for Seabrook Station until a long-term solution is implemented to address concrete degradation at the plant. Concrete surrounding an electric control tunnel at the nuclear power plant has lost almost 22 percent of its strength and is showing signs of an alkali-silica (ASR) reaction because of more than a decade of ground-water infiltration, according to an NRC inspection report released in May 2011. The degradation was discovered during a below-grade inspection of the accessible portion of the foundation, including the tunnel, a safety structure with vital electric cables that support the cooling system used when the reactor is shut down. “Our preliminary analysis has been confirmed and reconfirmed by the NRC, and the best and brightest ASR experts across the country who have been on site and continue to look at this issue: ASR is not impacting the safe operation of the plant,” said Alan Griffith, spokesman for plant owner NextEra Energy Seabrook. Griffith noted that the company reported the degradation to the NRC and the public a year before the commission’s inspection report was released. “We’re confident we’re absolutely on the right track with our strategy, which includes comprehensive monitoring and analysis being conducted by outside experts,’’ he said. The NRC said it found no impact on electric systems, piping, or other components in the underground structure. The concrete walls are performing well beyond design specifications, according to the NRC and the plants owner, NextEra Energy Resources. The NRC has concluded that the plant, which generates enough electricity to power more 1 million homes each year, remains safe. The problem at Seabrook came to light just months after Japan’s Fukushima Daiichi nuclear crisis last March heightened public concern about Seabrook’s safety as the facility seeks to extend its operating license. NextEra is hoping to receive approval soon to add another 20 years to its 40-year license, which is set to expire in 2030. Local politicians are voicing deep concerns about the possible extension of the plant’s license. They are quick to point out that the NRC has conceded that it does not know the scope and severity of the degradation throughout the plant’s entire foundation and note that the commission in November notified other nuclear power plants with similar concrete foundations to be vigilant about this issue. The resolution, passed by a unanimous vote of the City Council, was signed this week by Mayor Donna Holaday and is being sent to the NRC’s chairman, Gregory B. Jaczko. Newburyport’s resolution closely followed the Jan. 24 decision by the Newbury Board of Selectmen to send a letter to the NRC calling for a halt to Seabrook’s relicensing effort until the degradation is addressed. In Amesbury and Salisbury, local officials are considering taking similar action. The Amesbury City Council on Tuesday is scheduled to hold a public workshop in the Town Hall auditorium to “discuss the issue and decide whether or not this is something the council would like to consider taking action on,’’ said Mayor Thatcher W. Kezer III. In Salisbury, a public workshop is planned for March 5 at Town Hall. Local activist Bruce Skud, a cofounder of “No More Fujishimas,’’ is expected to speak at both workshops. The group was formed last fall and is the driving force behind local opposition in Massachusetts communities that lie within the 10-mile emergency planning zone for Seabrook Station. In all, there are 23 communities in the emergency zone, including six in Massachusetts: Amesbury, Merrimac, Newbury, Newburyport, Salisbury, and West Newbury. Construction on Seabrook began in the 1970s, but lawsuits, public opposition - including a 1977 protest by the Clamshell Alliance that quickly became a symbol of the environmentalist antinuclear movement - and other problems prevented the plant from ramping up to full power until 1990. Seabrook, which has a different design than the Japanese plant, was built to withstand significant, sustained flooding, and an earthquake greater than magnitude 6. Still, the concrete degradation is causing some politicians to question whether Seabrook is becoming increasingly compromised. 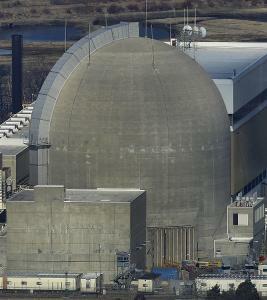 In recent weeks, state Representative Michael A. Costello, a Newburyport Democrat who also represents Amesbury and Salisbury, and state Senator Steven A. Baddour, a Methuen Democrat whose district stretches to the Atlantic shore, wrote separate letters to Jaczko to express their concern about the safety of the plant. The state leaders called on the NRC to halt relicensing of Seabrook until the commission fully and completely assesses the concrete degradation, and asked that the NRC require Seabrook to repair the compromised concrete and stop the infiltration of ground water that is believed to have caused it. Both politicians also asked the NRC to ensure that the problem is resolved by conducting tests and inspections over multiple years. The NRC, in a Jan. 25 letter, said the commission could not comment on the politicians’ request to halt the relicensing, citing the NRC’s adjudicatory role in the Seabrook license renewal process, which is currently pending before the commission on appeal from the Atomic Safety and Licensing Board. The NRC referred all other concerns about the concrete degradation to its technical staff. “Please be assured that should information at any time show that there is a basis to question the continued safe operation of Seabrook, the NRC will take appropriate action as part of the agency’s ongoing safety oversight,’’ wrote Annette L. Vietti-Cook, commission secretary.